Eddie Levert Sr. & Gerald Levert Give Fans "Something To Talk About"
CLEVELAND, OH -- (MARKET WIRE) -- May 22, 2007 -- The thing that holds a father and son together most is the love and respect they have for one another. 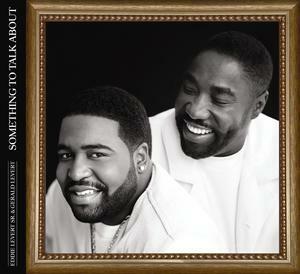 Eddie Levert Sr. and Gerald Levert had a special father-son relationship that was unmistakable. On June 12, 2007, the legendary duo continues the remarkable Levert family legacy with the Atlantic Records release of a soul-stirring collection of songs suitably titled "Something To Talk About," available just in time for Father's Day. "Something To Talk About" is the second duet album released by the dynamic duo. "Father & Son," released in 1995, was the first collaboration between Eddie & Gerald and included their rendition of the pop classic "Wind Beneath My Wings," and generated the wonderful remake of The O'Jays' "You've Got Your Hooks in Me" and the suave hit ballad "Already Missing You." Their performance of "Wind Beneath My Wings" received a standing ovation at the 1995 Essence Awards. The eagerly awaited "Something To Talk About" serves as a touching reminder of the close relationship the loving two-some shared before Gerald's untimely death in November 2006. Most duos compete for the spotlight, but the way this father and son play off of each other, their voices blend so seamlessly that it's often difficult to tell which vocal powerhouse is taking the lead. The smooth steppers-groove "Close & Personal" calls everyone to the dance floor, while the velvety "That's What I Do" is reminiscent of the classic ballads that the Cleveland, Ohio natives are both famous for. The album's title track is a refreshing remake of the Bonnie Raitt classic "Something To Talk About." Eddie Levert Sr. is a founding member and one-third of the highly successful trio The O'Jays. Celebrating over forty years as a major staple in soul music, their trademark musical style, combined with their spectacular showmanship, has garnered them countless accolades and awards. The O'Jays have enjoyed numerous hit songs, including "Love Train," "Stairway to Heaven," and the theme song of Donald Trump's "Apprentice," "For the Love of Money." Eddie continues to perform with The O'Jays and will be releasing the heartfelt book, "I Got Your Back," which tells of the bond he and Gerald shared. With a powerful, soulful, and near carbon copy of his father's voice, Gerald's two-decade music career resulted in millions of albums sold and numerous R&B chart-toppers. Gerald's claim to fame began in 1986 as a member of the R&B trio LeVert, which also included his brother, Sean, and childhood friend Marc Gordon. They quickly racked up hits like "(Pop, Pop, Pop, Pop) Goes My Mind," "Casanova," and "Baby I'm Ready," while scoring six top ten R&B albums. Gerald embarked on a solo career in 1991 with the release of "Private Line," the first in a string of gold and platinum solo albums. In 1995, he recorded "Father & Son" with Eddie Sr. Gerald's last studio album, "In My Songs," was completed just prior to his death. Released in February 2007, it debuted at #1 on the national R&B charts.